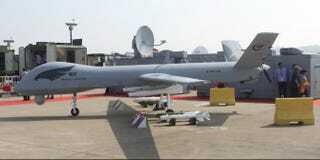 China's getting into the UAV game in a big way. Well, really, the only way it knows how: by closely mimicking the existing technology of a foreign power and slapping a new name on it. Say hello to the MQ-1 Preda—I mean, Cai Hong-4 "Rainbow". Designed and constructed by state-owned aircraft manufacturer China Academy of Aerospace Aerodynamics of China Aerospace Science and Technology Corporation (CASC), this multipurpose drone, officially known as the Cai Hong-4 (CH-4), is a jack-of-all-trades for China's fledgling UAV efforts. It measures 29 feet long with a wingspan twice that, which allows the CH-4 to remain aloft for up to 38 hours at heights up over 26,000 feet. This makes it ideal for a variety of surveillance and patrol operations. It can also carry up to 760 pounds of bombs and missiles—capable of attacking both land and sea targets with a 5-foot accuracy radius—which enables the platform to switch from ISR to strike missions without landing and re-equipping. "During acceleration and deceleration, the drone kept taxing on a central line on the runway," CASC Rainbow No.4 Project head Li Pingkun told ChinaNews. "It's well-positioned to carry out the subsequent missions. The test flight was very successful today."